This spring, the National Center for Women in Technology (NCWiT) recognized four Informatics Diversity-Enhanced Workforce (iDEW) students from Pike High School. 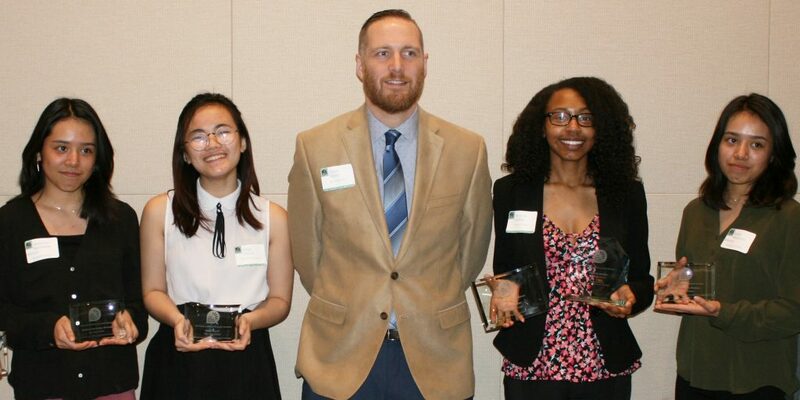 Essence Jordan was a recipient of the Indiana Aspirations in Computing Award and National Award Honorable Mention; Katherine and Karen Barrientos Moreno and Myky Huynh (all pictured) received Indiana Affiliate Honorable Mention. Justin Smith (pictured), iDEW teacher at Pike, and Sue Reagin, iDEW teacher at Arsenal Technical High School, were also invited to attend the ceremony held on April 11. The NCWiT Award for Aspirations in Computing builds a talent pool for the growing technical workforce and helps academic and corporate organizations celebrate diversity in computing by honoring young women at the high school level for their computing-related achievements and interests. Recipients are selected based on their aptitude and aspirations in technology and computing, leadership ability, academic history, and plans for post-secondary education. The IU School of Informatics and Computing at IUPUI has had four past NCWiT Indiana Aspirations Award winners as students: Sarah (Parker) Raheja, Hannah Roper, Mikaylah Gross, and Morgan Henderson. This fall, an NCWiT Indiana Affiliate Award recipient from Hamilton Southeastern High School plans to attend the School of Informatics and Computing. Vicki Daugherty, iDEW program manager and diversity coordinator for the School of Informatics and Computing has high praise for Raheja, Roper, Gross, and Henderson, explaining that they all have a passion for serving community, particularly in areas that help to broaden participation in computing. As members of the STARS Computing Corps, they harnessed their interests and talents to plan and implement numerous programs on campus and at community events to introduce technology to thousands of K–12 students. “I’ve been privileged to spend a great deal of time with these young women. They are goal setters, community builders, and informaticists. I know they will continue to do great things with their lives,” Daugherty said. Sarah Raheja graduated in 2015 with a B.S. in Informatics, minors in business and French, and certificates in human-computer interaction and e-commerce. Raheja was an early member of the STARS Computing Corps and president of the student group, Women in Technology at IUPUI. She landed a spot in GE’s competitive Digital Technology Leadership Program and today works for GE in Atlanta as a senior UX designer, where she also serves as a career mentor. Raheja is a reviewer for NCWiT scholarship and seed fund applications, and organizer for the GE Girls Who Code summer program. Hannah Roper completed her B.S. in Informatics this academic year and is on track to finish her M.S. in Human-Computer Interaction through the Accelerated 5-year B.S. + M.S. program. She has also been a member of STARS Computing Corps and has served two years in iDEW as a near-peer mentor at all three participating high schools. Daugherty remarked that Roper has gone above and beyond in helping students prepare for college readiness. Roper is also active in the community and outreach events and was a member of IUPUI’s OTEAM. She has recently been hired by MISO Energy. Mikaylah Gross completed her B.S. in Informatics in 2016 and her M.S. in Human-Computer Interaction this May. She is one of the original iDEW near-peer mentors and is outgoing president of Women in Technology at IUPUI. Gross was first author of a paper on accessibility for blind or visually impaired smartphone users that was accepted at the Web4All conference in Lyon, France and received a Best Technical Paper nomination. She is employed at Eli Lilly and Company as a human factors specialist. Morgan Henderson is a rising senior pursuing a double major in informatics and communications with a certificate in network security. She is an iDEW near-peer student mentor, currently in her second year. Henderson is also serving her second year as president of Informatics and Computing Student Government and has been active in Greek life at IUPUI.